GUZ KHAN is not a man to reckon with – confident, self-assured, charming, witty, you can see why his alter ego has caught the attention of a very diverse audience. 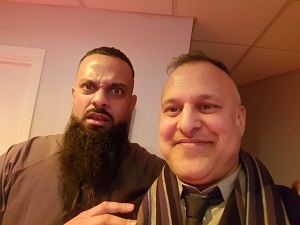 His alter ego is, of course, ‘Mobeen’, a larger than life, bearded Muslim from Small Heath, Birmingham, as seen on BBC Three comedy ‘Man Like Mobeen’. With Series Two set to hit our screens from today (February 7) we caught up with Khan who created the show and co-writes it. Series 1 picked up several awards, including the RTS Midlands Awards and an Asian Media Awards last year. For those of you who have watched the first series, you’d be pleasantly surprised to see how ‘Mobeen’, played by Khan, has taken a slightly different approach and appears to ratchet things up a notch or two in the forthcoming series – which was screened to the press and invited audience at The Glee Comedy Club at The Arcadia Complex in Birmingham last month. There are more references to South Asian idioms, which always manages to raise a laugh and there seems to be more intensity to the social and political issues highlighted including knife crime, youth and gang culture, and references to teenage pregnancy, Brexit and the NHS. ACV (Khakan Qureshi): How do you feel about BBC commissioning series number two? Guz Khan (GK): You know what? I was flapping. I thought: “Yo, they’re not gonna recommission it because it was such, like a unique take on what a sitcom is, what a traditional comedy is. I thought ultimately, people have to fit things into brackets and frames and “oh, we know what it is”, and ‘Man Like Mobeen’, has shown really, so many different things all in one show, so when it got recommissioned, I was so happy. I think it resonated with so many people – so, my initial thought dropped, kind of my one aim was that the people that it’s about, they will like it. But we were so blessed to have a plethora of people, from in and around the West Midlands, and working class people to well beyond. I was getting emails from people like Cuthbert from Monmouth or whatever his name,and I’m thinking “What you doing watching this show whatever?” he liked it! And that’s just indicative of how people really got attached to the show. And I think looking back on it, we created a very family feel to the cast members – there was crazy stuff going on, but you like being in their presence, so yeah, we were very lucky. ACV: So, how important is your image or identity within this comedy, because obviously, you’re portrayed as a certain individual with a particular look and people assume a lot, don’t they? GK: Of course, of course! You know, like the important thing is, obviously Mobeen as a character came up about just having a riff and having fun on some news reports, international news reports, about the fact that Birmingham was a no-go zone for anyone who wasn’t Muslim, which was hilarious! But, in the States (US), across their TV networks and especially on like Facebook pages and stuff for the people who follow that kind of news, it was FACT. I just kind of find that hilarious, that: “Woah! This is how news travels nowadays”. So, Mobeen came about through those means, but really when it came to the series, it’s like, “How do we best use this guy, tell his life story and his point of view on the world, and his place in the world to explain his life story and his view on politics, on social class, on race, and a whole load of things, and it’s just so nice because I always wanted to see (something like this) myself and it just turns out that so many (other) people wanted to as well, so yeah, it works. GK: There’s a lot of toxic masculinity in those old school stereotypes, but these three, in the hood, with Mobeen – definitely a guy who gets up to no good – there’s a lot of love and camaraderie between them so, most of that stuff comes from the experience in my own life. But when it comes to Aqsa (Mobeen’s school attending sister in the show and played by Duaa Karim), I was raised by three women, my mum and my two sisters, so I wanted to make her as strong and as powerful as the women I was raised by and she is. Whenever she’s in a scene with the lads, she bosses them to pieces and they haven’t got a word to say back and that was so important to me because South Asian women on TV, the representation of them is so one dimensional. It’s usually a wife of a terrorist, abused or maligned, they have no self-confidence, and Aqsa, really, little Aqsa breaks that stereotype, breaks that mould and I was really proud to see that on TV. GK: I was very vocal with a lot of my cast and crew members about ‘Citizen Khan’. No doubt there are many people who love the show. So, when I said “I don’t think it’s a show that represents the Asian community properly” – there were a few people definitely upset by that. When I started looking at the AGE group, of those who liked ‘Citizen Khan’ , they definitely weren’t leaning on the younger side of the spectrum. So, for this new generation, we’re probably at tipping point of that – you’re talking mid-thirties and younger, we’ve grown up in a time when you can be unashamedly confident of who you are. When I look at my sisters’ generation, they’re ten years older than me, though they were very strong they did have people come up to them and (whispers and mimics) “Put your head down, just get on with it”. If they think we’re a bit (GK adopts Indian accent and tootles a bit), ‘then let’s get on with it’ Whereas OUR generation are like “Now, we ain’t doing no toot, toot, toot” for you, yeah. We’re moving away from the taxis and the corner shops. ‘Citizen Khan’ feels a lot more like a 1960s or 1970s perspective of working-class life of an Asian family. ACV: I think Mobeen is a loveable rogue and also what you do is, show it as it is in ‘the community’, but you also throw a curve ball and there are social/moral values involved and there’s always a tagline at the end of the episodes, which is current and relevant to what’s going on society today. So do you think when a white man has a beard, he’s hipster but when it’s a brown man, he’s a terrorist? GK: That state of mind is a construct of media representation, of our political system, because ultimately these ideas are being fed through a vessel. Where is that vessel? You’ve got a Home Secretary who is Asian himself, who is whipping up fear about immigrants landing in the middle of the ocean, close to the British borders, making out, as if it’s some kind of invasion and for me, that’s when I opened my eyes. Quite startling was like, it’s just a game to (some) people. It’s about gaining a voter base. There’s so much history that people forget. But fundamentally I think there’s so many divisions because don’t meet (each other). There’s always the point on TV of the heavily bearded man who is very serious, very introverted (and adopts accent who says): “Go inside the house and do the bloody cooking!” The truth is I know so many people throughout my life from Sikh, Muslim backgrounds who specifically wear bigger beards because of their religious tenets but they are the funniest guys you will ever meet! ACV: Would you ever consider introducing a LGBT Muslim character into the show? GK; Yeah, I mean, the one thing that we’re always SUPER-sensitive about doing is making sure that we have the knowledge and perspective to write about the issue. We’ve considered doing something about domestic violence because it is quite close to a few of us and something we’ve experienced before, and again and we thought ‘Man like Mobeen’ could look at it from a unique point of view. But we have only 22 minutes and if we don’t reflect the severity of the subject matter it means you shouldn’t do it. I think especially with the South Asian community, LGBT issues are still very taboo. It shouldn’t be tokenistic, I always try to write about what I know. ACV: What can we expect of Mobeen in Series II? GK: We are going to have you on the edge of your seat hopefully. It’s gonna be real, it’s gonna be authentic. So, I think you’re going to enjoy it! Man Like Mobeen is a Tiger Aspect production written and created by Guz Khan and Andy Milligan. The producer is Gill Isles, the director is Ollie Parsons, the executive producers are David Simpson and Myfanwy Moore. It was commissioned for BBC Three by Kate Daughton and Damian Kavanagh, whilst Controller BBC Three.